Lawrence J. Lewandowski, professor and co-director of clinical training in the school psychology program, has been appointed interim chairman of the Department of Psychology in the College of Arts and Sciences. He takes over for Peter Vanable, who has been named interim dean of the Graduate School and interim vice president for research for the University. Lewandowski’s appointment took effect in January. It is expected to span about 18 months. “I am delighted to serve the college and department in this role, especially given the enthusiastic support of the dean, our terrific faculty and our highly productive students,” says Lewandowski. Lewandowski specializes in school psychology and clinical neuropsychology. He teaches courses in brain and behavior, neuropsychology, socioemotional assessment, school psychology practicum and internship supervision. His research focuses on test-taking skills and test accommodations for students with disabilities. He is a consultant to various test agencies, including the ACT, College Board, National Board of Medical Examiners and National Conference of Bar Examiners. 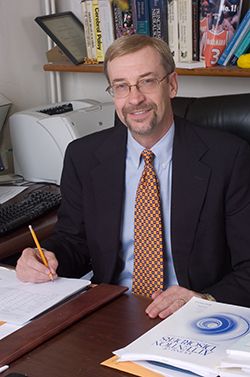 In 2000, Lewandowski was named a Meredith Professor for Teaching Excellence at the University. He also holds a courtesy appointment as clinical professor in the Department of Psychiatry at SUNY Upstate. Lewandowski’s most recent book is “Test Accommodations for Students with Disabilities: Research-Based Practice” (with Benjamin J. Lovett, American Psychological Association, 2015). He is the author of many journal articles and book chapters. He is a member of the American Psychological Association, the National Association of School Psychologists, the International Academy for Research on Learning Disabilities, the Learning Disabilities Association of CNY and the New York Association of School Psychologists. He has been active on the University campus, taking part as a member of the University Senate from 2006-2014. He is also active as a Gateway faculty member, in the Health Professions Advisory Program and in Project Advance. Lewandowski received his doctorate in educational psychology from the University of Michigan in 1978.